German postal carrier Deutsche Post DHL is testing a drone delivery service that could deliver medical and food supplies to areas with minimal road access. On Monday, the company ran a test delivery of its so-called “parcelcopter.” In a flight that lasted two minutes, remote-controlled drone carried a batch of medicine from a pharmacy in the city of Bonn to the company’s headquarters, just across the Rhine River. The test came just a week after Amazon CEO Jeff Bezos announced on 60 Minutes that his company is developing plans for drone delivery, though it still faces many technological and legal hurdles. In the DHL test, with two employees controlling it from the ground, the drone flew a little more than half a mile, at a height of about 165 feet. It is capable of carrying up to 2.6 pounds, and can autonomously navigate using GPS coordinates. The drone cost about $54,900, according to Reuters. There is no word on a partnership between Matternet and DHL, and Matternet did not respond to a CBS News request for comment. DHL spokesman Thomas Kutsch told The Local that this week’s test flights, which were approved by local aviation authorities, are strictly for research purposes and that the company is interested in helping deliver supplies to hard-to-reach areas. Given DHL’s involvement in disaster relief efforts – the company sent a response team to the Philippines after typhoon Haiyan to oversee the logistics and distribution of incoming relief supplies – disaster relief may be the first place we see the company using the technology. 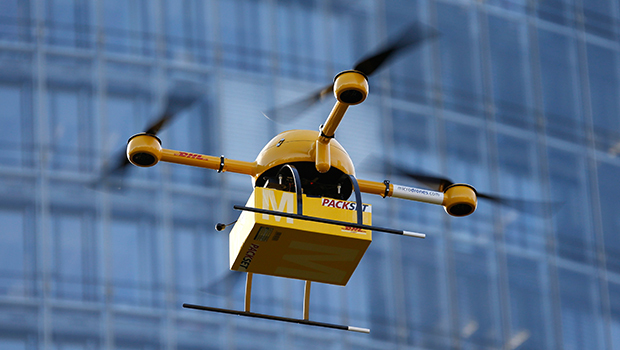 United Parcel Service (UPS) is also researching delivery by drone. In the United States, Amazon, UPS and their competitors face Federal Aviation Authority (FAA) regulations which currently restrict commercial drone flights.